In the search bar ( ), enter the first letters of your name, and select it from the list. 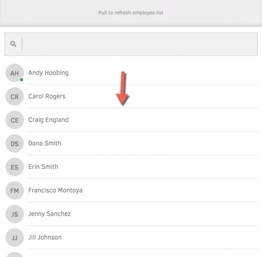 If you are a new employee and your name is not in the list, to refresh the list, scroll to the top of the list, and pull it downward. Your name will now display in the list. Enter the PIN that was provided to you by your account administrator. If your PIN has not yet been set up, you will be directed to set one yourself. If you have forgotten your PIN, click Forgot, and you will be directed to create a new PIN after choosing to send a temporary PIN texted to your number or entering in your TSheets full username and password. Note: If you have a keyboard connected to your device, you can use the up and down arrow keys to navigate the employee list, and the numbered keys to enter your PIN. If no jobs or customers display: Tap Clock In. If you want to clock in to your last job/customer: Tap Clock In to [job]. The "Have a great day" window displays. After signing in, tap Switch. The "You're good to go" window displays. After signing in, tap Take Break, and select a break type (if shown). The "Have a good break" window displays. After signing in, fill out any notes or other fields if necessary.